Today I decided to try making a loaf of sourdough bread. The other day my neighbor gave me the starter. The recipe I used called for one cup of sourdough starter. I didn't have that much, so I used five cups of flour instead of six. It was easy to make. I used a 1930's recipe from one of my mom's old cookbooks. It called for flour, yeast, water, butter, salt, and baking soda. I blended the ingredients with an electric mixer, and scraped the sides of the bowl with a rubber spatula. I really enjoyed the rhythm of kneading the bread. I worked it with my hands for eight minutes on the counter. It felt very meditative and relaxing. Baking bread is so grounding. It always reminds me of how our ancestors lived. Baking bread was a ritual in those days. The dough was extremely elastic. I covered it in the bowl, and put it in the oven on a very low temperature. 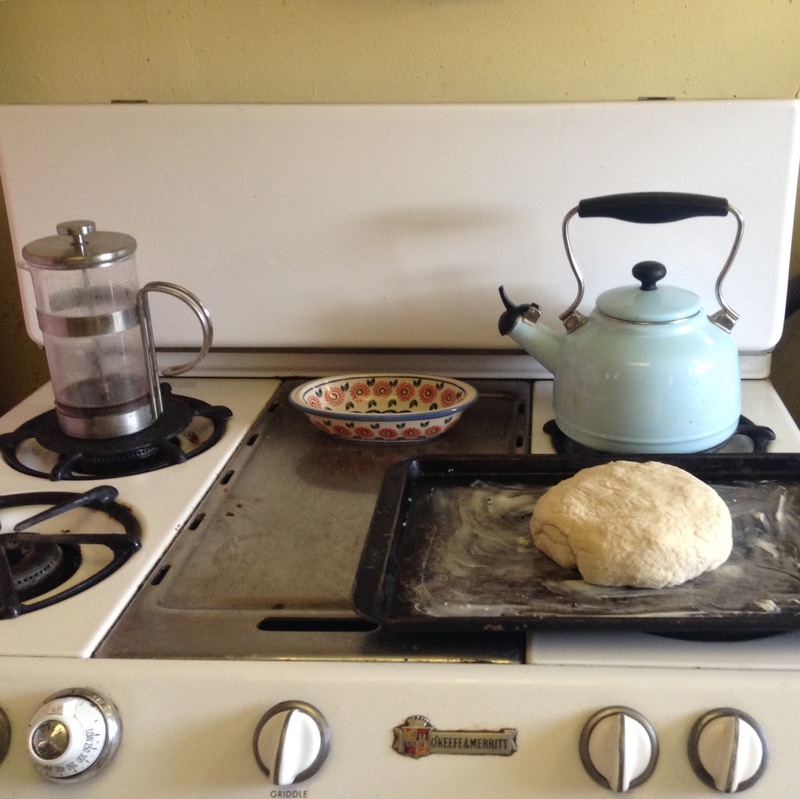 I didn't think that my kitchen was warm enough for the bread to rise. After punching it down, I separated it into two sections, and let them rest. After ten minutes, I rolled them into balls and tucked the ends underneath the bottom. I flattened one to six inches in diameter, slashed it with a sharp knife, and let it rise again. I put the second one in the fridge for future use. The finished loaf looks very pretty. I baked it with a small pan of water in the oven, since my oven tends to dry things out that need to be moist. I have a 1950's vintage O'Keefe and Merritt. 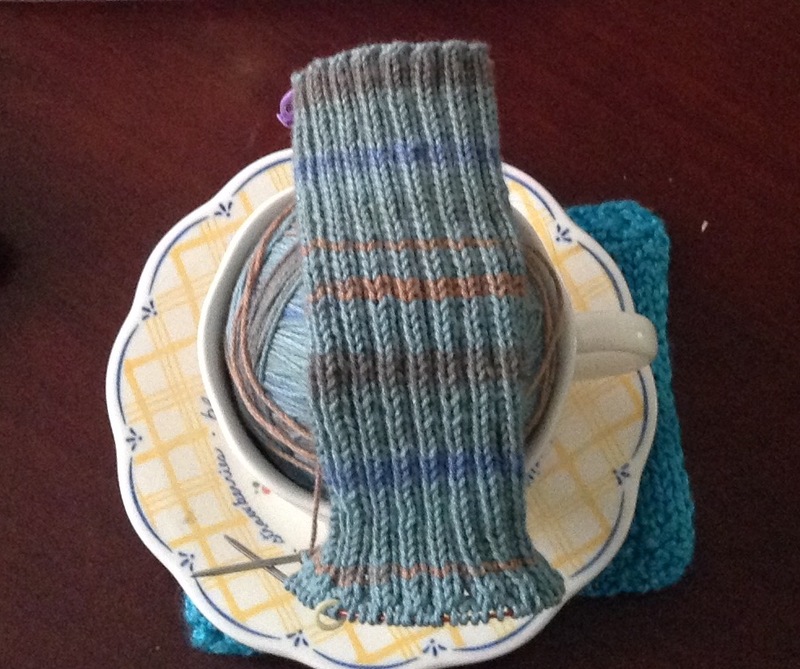 This is some sock yarn that was given to me by a local knitter. She's had it since the 1980's. I love the colors. The bread tasted okay, but was nothing special. It just kind of reminded me of store bought white bread that had been sweetened. The sourdough flavor was barely there. It's still good, though. I toasted some with Tillamook cheese, and that really improved it. It will make excellent breadcrumbs for casseroles, and I think it will make a tasty bacon and cheese sandwich, or as a side with a salad. The dressing would give it more flavor. To be honest, I think I really prefer The New York Times No Knead Bread recipe. It makes such a delicious, chewy, Artisan loaf. I have used apple cider in that recipe to give it a slight sourdough flavor. I love the moistness of it. The dough is very sticky to work with, but the end result is divine. This was just okay. Oh well. Maybe I'm too picky; at least now I know. I don't think it's really worth the effort, especially if you are spending all of that time making the starter, but maybe I'm missing something. I guess my expectations were too high. I grew devouring round loaves of Columbo extra sour sourdough bread from San Francisco. It was baked and delivered to the supermarkets daily, and boy was it incredible! Mine didn't come close, but I will eat it. Next time I may try using some semolina flour that I have in my cupboard. Thank you for your comments. They add so much talent and energy to the blog. Please comment in English. I'm sorry, but comments with links will not be published. If you enjoy the posts here, please share them. i love making homemade bread. especially the no knead one. we always have one in the kitchen - your bread looked pretty! Hi Angela, That's great. I used to make that recipe all the time, too. It's a wonderful consistency. Well, the sourdough bread might not have tasted that special, but it sure looks lovely! Maybe the starter hadn't soured enough? Maybe there wasn't enough of it to give the sourdough taste? I made a no knead bread, once, and have been thinking of making it again, with whole wheat flour (need to buy). Right now, a slice of warm bread with butter sounds wonderful! I think you're right, Bless. I may try again. I generally don't eat many baked goods anymore. As long as my body doesn't react with inflammation, I'll eat it. I had a slice with butter and garlic, toasted, for dinner. That was really delicious with a big salad. Hi Jules, Yes, that recipe is delicious. I just love it. This bread will still get eaten. I won't use sugar in my bread recipes anymore. I make sourdough bread all the time, with the same starter: you don't need to make a new starter all the time! I feed it after each batch and put it in the fridge until next time. When it is time to bake, I make the dough and leave it out all night before cooking the next day. The flavour develops this way, and the starter digests the gluten in the flour which makes it easier on the gut. 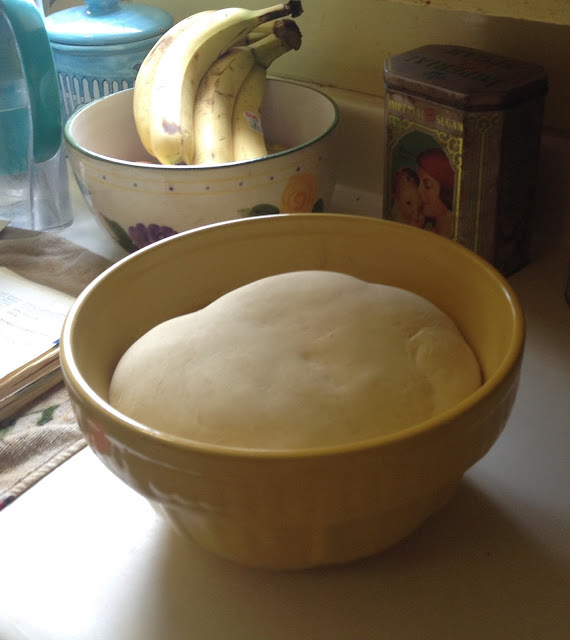 Hi earthmotherwithin, That sounds like the way I made the No Knead Bread. I definitely prefer it. I enjoy the kneading process, though. Maybe I'll start making homemade pizza again. I haven't made bread for a while. I used to make it every day when the kids were little. Nothing beats the taste or smell homemade bread but I haven't tried sourdough. I wouldn't know how it is supposed to taste. Hi Cherie, It has a delicious flavor, very tangy. The whole cottage smelled delicious while the bread was baking. Thanks Andrea. They have a Youtube video tutorial, as well. It was still fun to make. I just won't use that recipe again. just caught up, such lovely looking bread, shame it doesn't taste as good as it looked for you. I will have to look up the New York Times recipe. I try to bake to loaves of wheat bread each week for Steve. I personally can take or leave the bread, but he loves it. It has a single rise and is rather soft and dense. I like the idea of letting it rise in a warm oven-I will have to experiment with that! Eating real sourdough bread is always part of any trip to the City!!! HI Anita, How kind of you to bake fresh wheat bread each week for your husband. Yes, real San Francisco sourdough bread is to die for! The loaf looks fabulous, Stephenie. I'm sorry it was not that tasty. I have never made sourdough bread. Hi Nil, Thank you. It's fine, but not what I had hoped. That's okay. I will adjust what I'm doing. I think you will be an excellent bread baker, if you want to do it. Well it looks delicious, I bet your house smelled wonderful. Thanks Mereknits. Yes, the aroma of fresh bread was wafting through the cottage....I love that smell!